Latinos in Rural America (LiRA) is a public humanities project designed to broaden knowledge, engagement and understanding of the Latino/a experience in rural Ohio. 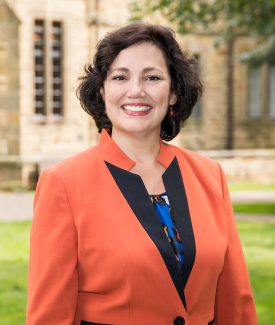 This project pursues the goal of providing an intimate window into the lives, origins and aspirations of Latinos in Knox County, home to Kenyon College. The oral history project is rooted in interviews and direct personal interactions with members of the community who represent diverse economic conditions, stages of life and aspirations within the broad social fabric of Knox County. LiRA was undertaken by Clara Román-Odio, professor of Spanish and director of the Latino/a studies program at Kenyon College and the principal project investigator; Amelia Dunnell '17, a Kenyon Summer Scholar; and Patricia Mota '16, a Kenyon Summer Research Fellow. The exhibit is organized into three distinct but complementary elements: a series of 10 bilingual panels that provide snapshots into the lives of Latino families in Knox County; a video that provides the audience an opportunity to experience Latinos talking about their lives; and a reflection piece in which we ask the audience to provide feedback on their experiences after having seen the exhibit. The exhibit was on display at several locations throughout the county before finding a permanent home in Kenyon College's community engagement office. Any views, finding conclusions, or recommendations expressed in this exhibition do not necessarily reflect those of the National Endowment for the Humanities.